Hello you guys! I have to share my excited for a contest with Avalon’s Perect Year contest and I legit think I should win! Now first and foremost, I want to say I feel like I never win contest but I had to apply to this. This was too big of an opportunity not to take a chance, because basically this would be the best blogger year ever! 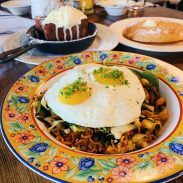 This is literally a once in a lifetime opportunity that more than amazing, where this new community in Alpharetta,GA is pretty much providing a year of luxury! Did you read all that??? Did you see all the varation of amazing-ness is happening for a lucky person?! This person (I hope its me) gets a chance to live in a luxe apartment for free, with free internet, clothing gift cards, shopping gift cards, weekly movie passes, beauty services, athletic services and more! Wow just wow…so what’s the catch? Why are they providing over $66,000 worth of prizes to this person? Who wouldn’t want this opportunity? I am just thinking already if I won all the fun thing I can do on a weekly basis and share it with you guys. I will be honest, A lot of these things I cant afford to do on a regular basis, I am still just a lil-ol-blogger, a 2osomething girl who tries to balance blog and grown-up life. I will be honest girlfriend is on a budget – I can’t afford this life yet! I don’t have any kids yet, I am single so I feel like I have so much opportunity to just continue to explore life and this wonderful sponsorship will be amazing for this perfect year! I have already had a great year blogging this year, but if I won this – man just the possibilities…it will be the best year ever! :: crosses finger:: Hoping for the best and I’m keeping optimistic! I really want to win, I would really appreciate you all just taking a peek at my video presentation (only a minute of your time) and comment below if you do think I would be perfect for this contest! If you been following me for a while you can see how this is right up my alley! Thanks so much! 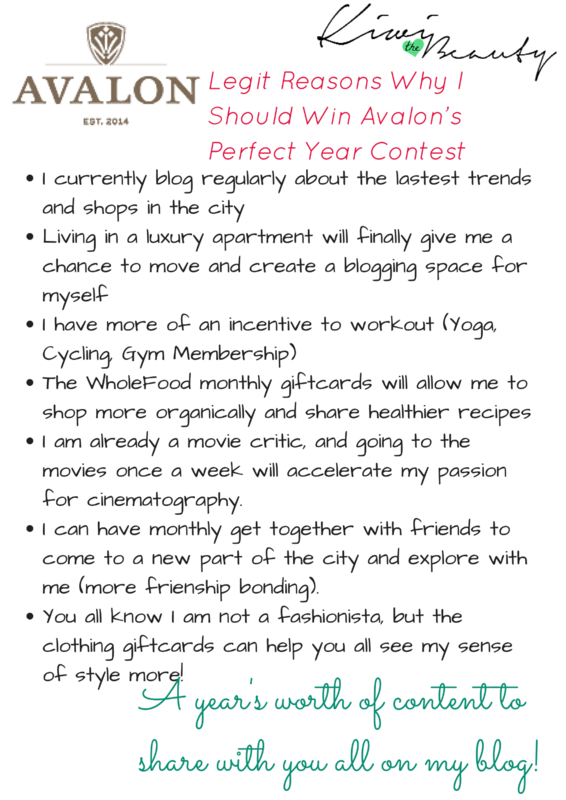 Learn more about the Avalon Perfect Year Contest (ended) here. Do you think I would be able to blog about these cool things for a year? What do you think is one of the best prizes on the list? Wow, that’s a seriously awesome prize! I hope you’re the lucky winner! Well if I could vote.. after watching your video clip I would vote for you. You are very personable and your heart is in it! Oh wow great prizes! Your clip is great, good luck I hope you win! Wow, what a tough call! I think the Whole Foods is a great prize, but then again they are all good. 1. The taxes would be ridiculous—check with a tax accountant when you win so there are no unexpected surprises when filing taxes. I hope you win so I can live vicariously through you!! It really does sound like the perfect year. Hol moly that’s a lot of products! I definitely think you would qualify, but that’s quite a bit of work! Wow, that is one amazing contest! I definitely think the housing itself is one of the best prizes on the list. Now that is a heck of a contest! I think you would be amazing because everything falls into your lifestyle. Your video is great, too. I would be excited to win a home for free for a year. I love alpharetta ga. It’s a beautiful area. I’d want to win too. Wishing you all the best. Hope you win! I love all of your reasons! Sounds like a lot to blog about. Good luck to you! I hope you win! Your reasoning behind why you should win is great!Good Luck! What a great list of prize items, I hope you win. I am not sure what I would choose, or do with that list. It’s huge. So many things I could do! That is a great prize package. I hope you win. My uncle would love the Regal Cinema tickets. My cousin would enjoy a year’s lease on a great apartment. I think they’re all great.Good luck!